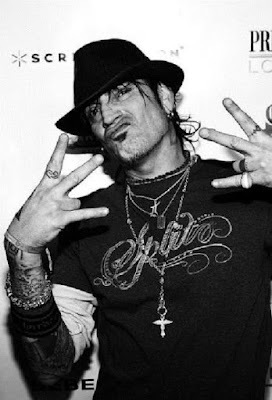 Richard Pachter: Tommy Lee @ Home Depot?! I'd just picked out a new kitchen faucet and was looking for that liquid you pour down the air conditioner drain thing to keep it from getting jammed with mold and gunk when I spotted a very tall guy with obviously dyed-black hair a few feet ahead of me, walking past. Familiar face. Took a moment to register but it was Tommy Lee, Motley Crüe drummer and Pamela Anderson's ex-husband and video co-star. He wore a loose-fitting shirt that covered up all of his tats, but the smirk was unmistakable. I filed the sighting away in the depths of my brain. It didn't seem all that remarkable. My sons swore to me that parts of the first Jackass movie were filmed in the same Home Depot, so why not? Then, this morning, reading the news-free local newspaper, I see a photo of the band and a blurb saying they're going to begin their next tour at a nearby venue and were in town for the press conference. So it probably was Mr. Lee at Home Depot, maybe getting something for HIS faucet. But what would he be buying at Home Depot? Does he have a home around here? Clearly he was getting some hardware to accessorize his myriad piercings. Did you get a glimpse of his faucet? Thank you for sharing this disturbing anecdote - back atya!